Arden Street disappeared as the New Covent Garden Market was built. 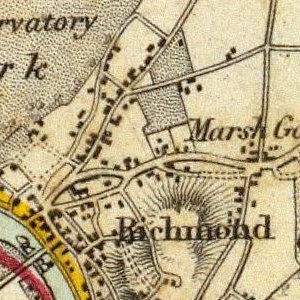 In the eighteenth century, Nine Elms Lane turned northwards, roughly along the present line of Cringle Street. 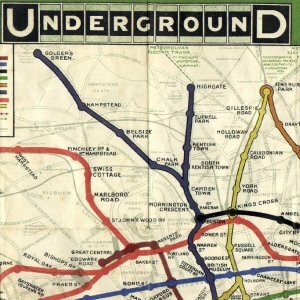 The main thoroughfare continued westwards: it was at first called Battersea Road, then Lower Wandsworth Road, and after 1871 Battersea Park Road. 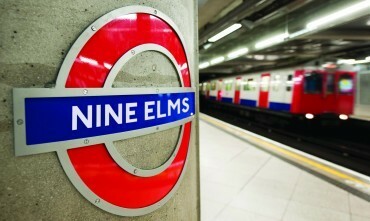 Hence the change of name from Nine Elms Lane to Battersea Park Road at this point. 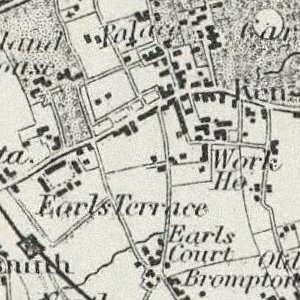 On the north side, the Royal Rifleman pub (1858–9) and a few adjacent houses at this junction marked the eastern extremity of Crown purchases of land for Battersea Park during the 1840s. Opposite, a short stretch of the main road was bordered in the years before development by some small fields up to the line of modern Sleaford Street. 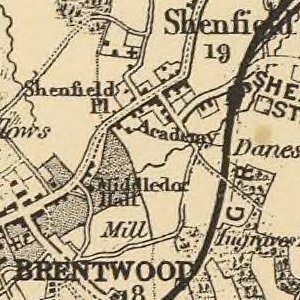 Most of this was Ponton land, but one acre belonged to the owners of Longhedge Farm before it was bought for St George’s (1827–8), Battersea’s second parish church. 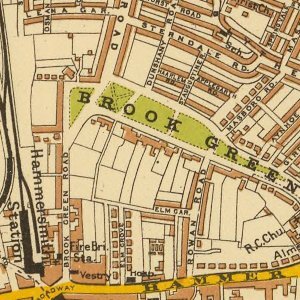 In 1862–70 the isolated church was encompassed by the biggest of four Battersea developments promoted by the speculating solicitor Frederick Haines and his accomplice W. R. Glasier of Glasier & Son, surveyors. 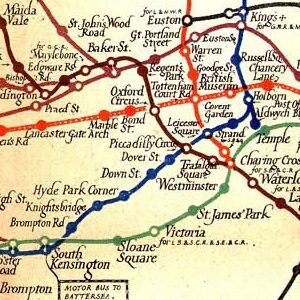 It comprised four new streets: Haines Street, Tweed Street, Arden Street and Cherwell Street. 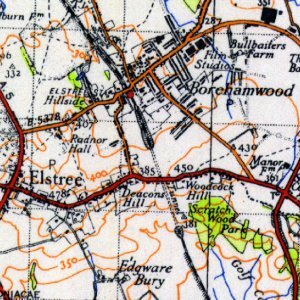 West of the church Ceylon Street was laid out by J. W. Brooker, architect, on a small freehold belonging to Edward Pain. The streets disappeared in the early 1970s as part of the siting of the New Covent Garden Market.